When mentioning the lights, nobody knows the fluorescent tube. Most families in Vietnam are still using the most popular types of fluorescent tubes type T5 (28W) - T8 (36W) - T10 (40W). However, the power consumption of these lamps is very large and contains high levels of mercury, which greatly affects the environment. As the technology evolves, LED lights are introduced to overcome all the disadvantages of fluorescent tubes, which are energy efficient and very environmentally friendly because they contain no mercury. - Power supply (Driver) : used to convert from AC to DC power supply to LED chips, good light source using good clock speed and stable, so it is very high price, cheap lamp using low quality power supply. should reduce the cost price. - LED Chip : Good LED tube type uses high-end LED chips, low-cost LED chips are not good. - Aluminum sheath : Good LED light bulbs use good aluminum housing, cheap lamps use plastic cover so the lamp does not dissipate heat effectively. - Save more than 80% of power consumption. - Does not emit ultraviolet and ultraviolet rays, safe and environmentally friendly. - Instant start, no flickering, eyes protection. - Lighting with high efficiency, energy efficiency and savings. - LED lighting has high concentration, brighter than traditional fluorescent lamps. - Optical degradation is very low. - Easy and convenient to install, maintain and maintain. - This is the most commonly used LED bulb on the market. The bulb is designed according to the size of fluorescent tube T8. 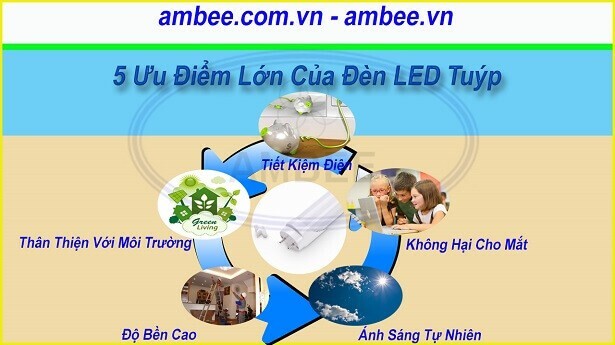 Wishing to be able to replace most easily and most fluorescent fluorescent lamps that are used most commonly in every family in Vietnam. - Diameter: The T8 tube on the market today has a diameter ranging from 25-27mm, but the usual habit is called theLED tube T8 . - Length: Most commonly used in Vietnam is 0.6m and 1.2m. 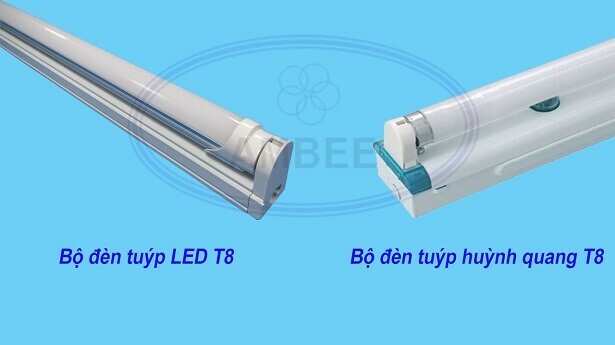 - Stand fitting: The T8 LED tube is designed to be the most convenient and convenient replacement for the T8 fluorescent tube because it is the same as the T8 fluorescent tube. All standard light bulbs that use the T8 or T10 bulbs have a standard lamp socket. - Appearance and material of the shell: The appearance of the T8 LED tube is similar to the shape of the fluorescent tube. The main structure is the outer shell of aluminum alloy, which gives the bulb a solidity and helps dissipate the LED chips. The cap section of the lamp can be transparent or opaque to help protect the LED chip inside. There are also some LED tube light bulbs that use glass tube material, but the product line does not have heat dissipation so the life of the lamp is not high. - Featuring lightweight, flexible and flexible LEDs that can be easily fabricated in a variety of shapes, and currently available in the market, the LED tube is made into a solid, not a is a shade and a trough. Although the shape is no longer a circular cross section, but the design of the lamp is the same as the T8 LED bulbs, these tubes are often referred to as T8 LEDs. - T5 fluorescent tubes have been considered as energy saving solutions compared to T8 and T10 fluorescent tubes.However, when the LED is released, the T5 fluorescent tube is no longer the most economical lighting solution. The T5 LED tube is designed to be the same size as the T5 fluorescent tube, but the difference here is that the LED tube is designed as a straight tube rather than a trough and a ball like fluorescent T5.